Welcome to VK Restoration, a fine art and antique restoration business located in Holyoke, Massachusetts. 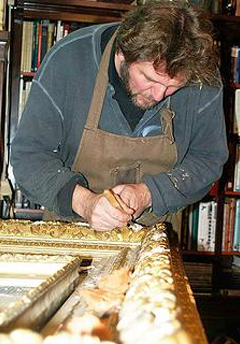 We restore paintings, frames, antiques and historic interiors. 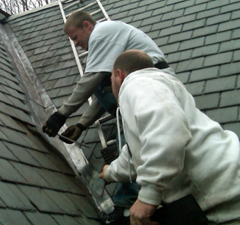 In addition we offer consultation services for historical societies, developers, and historic homeowners. Founder and director Vitek Kruta's training and experience in Historic preservation and restoration started in 1983- 1991 working with Wiedl Restoration Co. in Nurenberg, Germany, specializing in restoration of paintings, fresco murals, medieval sculptures, sacral furniture and altars, gold leafed frames and architectural decorative elements. During these years, Vitek also trained extensively in analytical techniques, documentation and research of historic finishes working closely with the Historic Preservation Commission of Munich. Included among numerous historical monuments, churches, castles, and buildings Vitek had the opportunity to work on are the Albrecht Durrer House, Hirschberg Castle, Faber Castell Castle and Wildbad, just to name few. Also included are over 100 churches in South German cities such as Rothenburg, Dinkelsbuhl, Regensburg, Nuernberg, Bamberg, Wurzburg, Eichstatt, Ansbach and Furth. Vitek currently resides in Western Massachusetts and is a consultant for various education and art organizations and historical commissions.